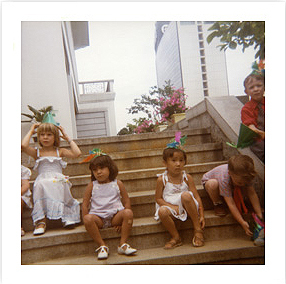 When I was about eight, my grandfather gave me one of his cameras – a Polaroid Color Pack Land Camera. My grandfather was a camera buff – always at the ready at family gatherings. He had recorded his intrepid life as an agronomist for the Foreign Service, taking his wife and three daughters though sojourns in Panama and Africa. 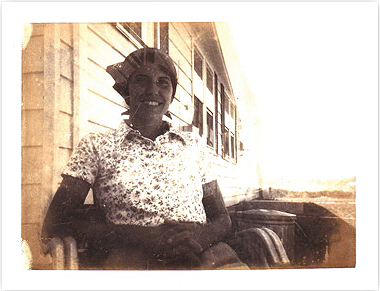 This specific photo of my Aunt Polly was taken by my young self in the back of my grandparent’s house on the eastern shore of Maryland. Polly was my favorite aunt – calm, gracious, loving, beautiful. She had four children but always had time to spend with me as well, patiently teaching me how to sew. When I took this photo, I remember a hot day, and the sound of the camera clicking through its motions. I remember the smell of the developing gel, pink and toxic, and being careful not to get it on my fingertips. Pulling back the sheet after waiting 60 seconds was like witnessing a magic trick – how could something so neat even be possible? This is an image I took on my 5th birthday, in July of 1982. We were living in Seoul, Korea at the time. I love how the kids all look terribly bored. I suppose that even at a young age, I was boring my photographic subjects. Everyone probably wanted to get back to pin-the-tail-on-the-donkey, or pass-the-parcel – and I just wanted them to pose for one more shot. The political situation in Korea was very much in flux in the early eighties. I remember balloons from North Korea flying over that backyard, dropping hundreds of propaganda fliers about how fantastic life was in the North. I’d run around the yard catching them as they fluttered down. Image & Narrative - Submit a PDF of your image(s) and your narrative piece(s) (limited to 250 words each) to: contact@earlyworksproject.org. Please see Entry Example page for format guidance. Entry Fee – There is no fee to enter your image(s) for initial consideration. Photographers who are selected by the curators for the exhibition will be asked to contribute $25 at the time of selection. This fee supports printing, presentation, installation, and shipping costs associated with the exhibition. Multiple Submissions - Photographers may submit as many image/narrative pairs as desired. Deadline – Image/narrative submissions are due by Monday, February 4th 2013.
powerful words with these photos. I agree with Ann. very powerful words with and poignant images!